That moment when the lava oozes out of a Molten Lava Cake is almost unbeatable. We are all familiar with a chocolate lava cake, served warm with a center that gushes out once you cut it open. What most do not know is that there are so many more flavours of lava cakes out there just waiting for you to try. We picked out the bests of many to share with you the best unique lava cakes in Singapore. From Matcha to Peanut Butter, Misugaru (Korean grain) and Mao Shan Wang - here is a list of the 10 most unique lava cakes in Singapore. Now, it is time to explore! This might look like the most boring or mild of the lot, but we can assure you that the cake itself is top notch. The cake did not taste overpowering with either chocolate or raspberry, and ABC managed to balance out all the flavours nicely in their Raspberry Chocolate Lava Cake (S$9). The warm cake will go perfectly alongside an iced cuppa. It was exciting digging into this beauty. While the cake (S$15) looked simple on the outside, molten warm peanut butter flows out magnificently upon digging in. The combination of chocolate and peanut butter is not new, but we loved how East 8 took the road less travelled and grabbed the opportunity to create this stunning lava cake. Served with pandan ice cream, this dish has all the goodness of a perfect molten lava cake, minus the richness of chocolate. Good news for those who do not like decadent cakes! The distinct flavours of cinnamon added a nice touch to the dessert and the subtle hint of pistachio was weaved in together nicely. 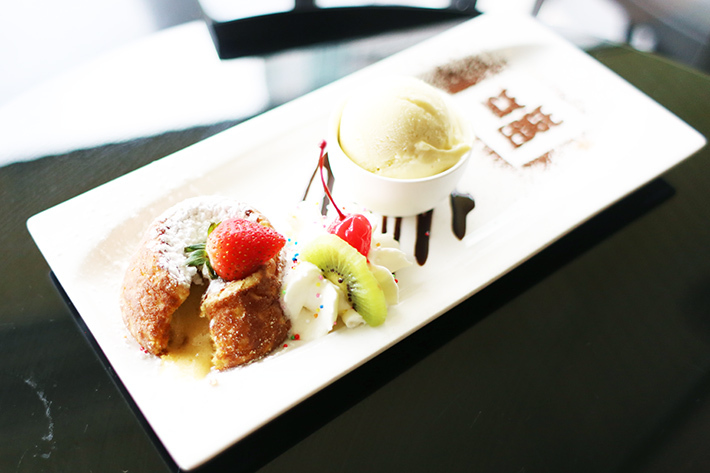 FYR’s Pistachio Lava Cake (S$10) has kept us longing for more. Five & Dime were one of the first to hop onto the salted egg yolk bandwagon by introducing their Golden Custard Lava Cake (S$12). Anything that oozes out with salted egg yolk goodness gets our heart, and Five & Dime totally aced this dessert dish. 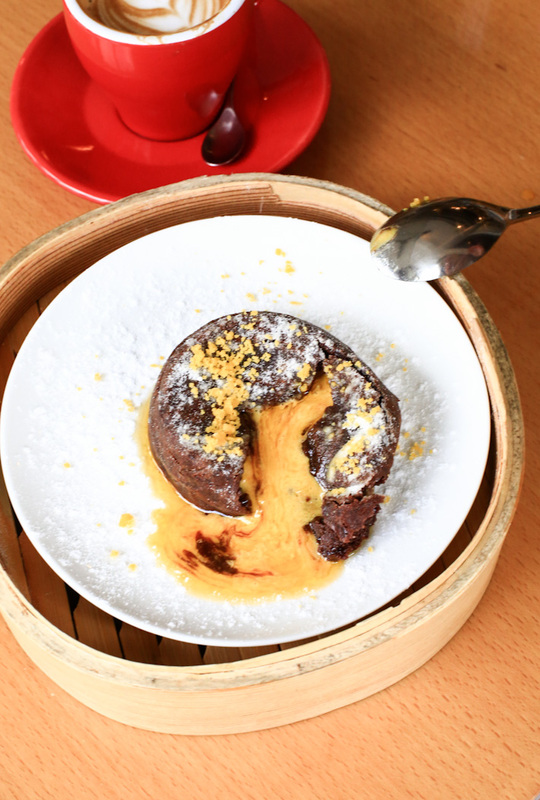 Five & Dime’s Golden Custard Lava Cake is listed in our guide to 18 to-die-for salted egg yolk dishes in Singapore. We were surprised to see a Thai restaurant serving lava cake, let alone Red Velvet Lava Cake (S$10.80) with a side of coconut ice cream! The cake looked unnervingly red when it first reached the table, but just like any good red velvet cake, the Red Velvet was subtly sweet with a distinct chocolatey taste. The refreshing coconut ice cream cuts the richness of the cake to make it more palatable. The Mao Shan Wang Lava Cake (S$14.80) at Ice Edge Cafe shall be the Archilles’ heel for all durian lovers. The cake itself was surprisingly light and far from overwhelming. We made it even more badass with a scoop of Mao Shan Wang ice cream to be served with the lava cake. Best decision ever. This simple molten lava cake is served alongside black pepper ice cream. Yes, you heard us right. Black pepper. Somehow the marriage of black pepper ice cream with a classic chocolate cake worked perfectly well. Don’t worry, it is still safe for the kids. The Misugaru Lava Cake (S$8.90) is made up of 10 different Korean grain that bears a taste primarily made up of barley and lotus. This is probably the ‘healthiest’ tasting of the lot – significantly lighter on the palate, and nothing overly “heaty”. We love that it is topped with fruits for a kick of acidity! 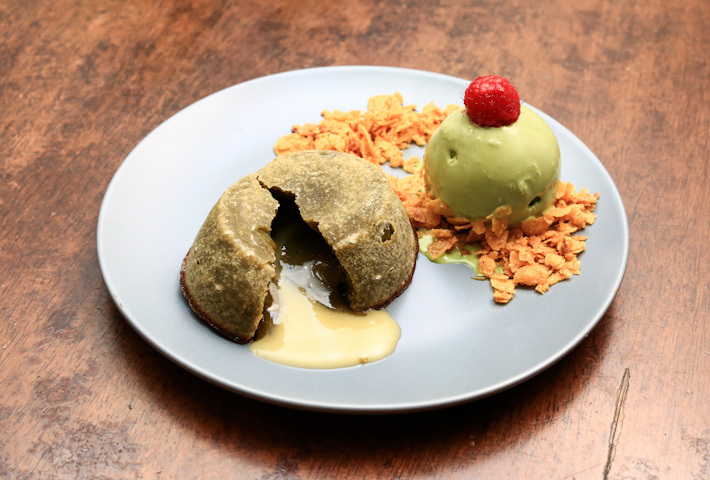 Matcha has always been a popular flavour and To-gather Cafe has gained some popularity with their take on a Matcha Lava Cake (S$7.20). The matcha flavour was distinct, and it makes such a pocket-friendly option! 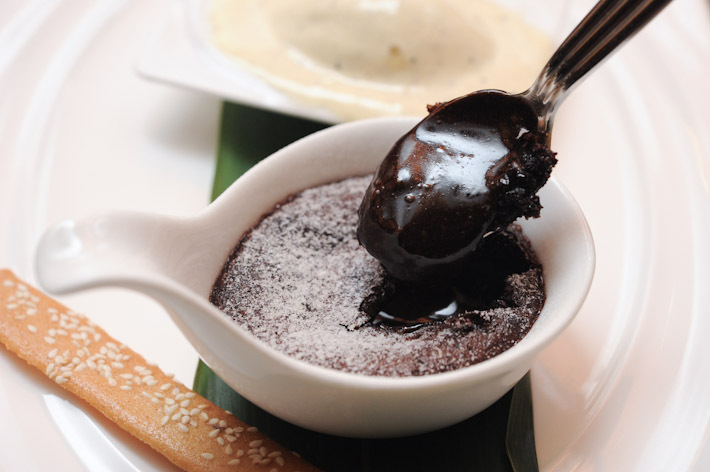 When you are dining at Violet Herbs, make sure to get the Valrhona Chocolate Fondant (S$16). The surprise of this dessert lies in the fact that it comes with truffle oil – an unexpected ingredient that actually makes the dessert even more fragrant.